On whether he would vote for the budget proposed by Rep. Paul Ryan, R-Wis.
Did Scott Brown flip-flop on supporting Paul Ryan's budget plan? By Louis Jacobson on Monday, May 23rd, 2011 at 4:01 p.m.
Did Sen. Scott Brown, R-Mass., flip-flop on whether he would vote for a budget proposed by Rep. Paul Ryan, R-Wis., when he wrote this op-ed in "POLITICO"? We take a look. The budget proposed by Rep. Paul Ryan, R-Wis. -- which would make deep spending cuts, hold the line on taxes and significantly change Medicare for those younger than 55 -- has become a key battleground between the two parties. The plan won passage in the House, with almost all Republicans and no Democrats voting for it. But Democrats have made the dangers of Ryan’s proposed changes to Medicare a major talking point, seeking to pin Republicans down on whether they support Ryan’s vision. First, Republican presidential candidate Newt Gingrich prompted a media firestorm for seeming to change his position on the Ryan plan. 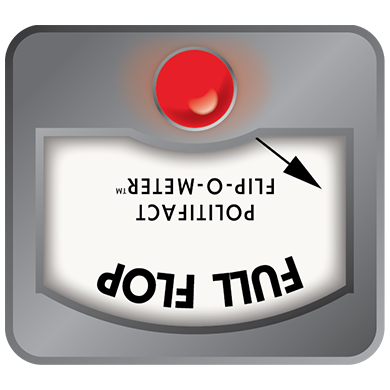 We rated Gingrich’s position a Full Flop. Now, Sen. Scott Brown -- the Republican who won a special election in 2010 to fill the Massachusetts seat long held by the late Democratic Sen. Edward Kennedy -- is attracting attention for his own possible flip-flop. According to the Newburyport Daily News -- a newspaper in northeastern Massachusetts -- Brown made reference to the Ryan plan during an annual luncheon of the Greater Newburyport Chamber of Commerce & Industry on May 13, 2011. "The leaders will bring forward (Ryan's) budget, and I will vote for it, and it will fail," Brown said. "Then the president will bring forward his budget, and it will fail. It will be great fodder for the commercials." 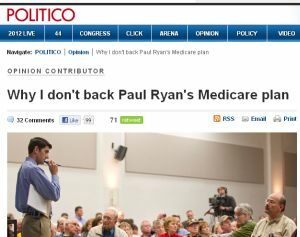 Ten days later, Brown authored an op-ed in the political newspaper POLITICO that was headlined, "Why I don't back Paul Ryan's Medicare plan." "While I applaud Ryan for getting the conversation started, I cannot support his specific plan — and therefore will vote ‘no’ on his budget," Brown wrote. A "no" vote on the Ryan plan is considered safer for Brown. Massachusetts voters historically lean Democratic, and Republicans who win election are usually moderate. So in his Newburyport speech, Brown said he’d vote for the Ryan plan, while in his op-ed 10 days later, he said he’d vote against it. When we took these two comments to Brown’s press staff, spokesman Colin Reed said, "He was making the point in Newburyport that political games are being played in Washington, but was not commenting on the merits of the bill." We agree that in his Newburyport comment, Brown focuses on the gamesmanship of budget-writing in Washington rather than on the nitty-gritty of its policy details. Meanwhile, in the POLITICO column, Brown was careful to praise Ryan’s role in starting the "conversation" even as he declared opposition to his plan. These suggest a somewhat nuanced position. Still, Brown did indicate pretty clearly in Newburyport that he would cast a loyal GOP vote for the plan, even if he expected that the vote would ultimately prove fruitless. Then 10 days later, in the POLITICO op-ed, he made clear that he wasn’t just disappointed by the Ryan plan but would definitely vote "no." Anyone reading his comments in the Newburyport Daily News would be under the impression Brown was voting for the Ryan budget, but he's not. So we give Brown a Full Flop. Published: Monday, May 23rd, 2011 at 4:01 p.m.